I once had a member of my congregation in Colorado Springs who was a spry and delightful 99½ years old. Although bedridden, she had hoped to make it to 100. An admirable goal, although she didn’t make it. During a visit, she once lamented that she was of no earthly use. She couldn’t help at church or even show up for worship, and she was unable to do much for herself or the daughter with whom she lived. Knowing her as I did, I asked if she prayed. She said, “Oh yes, Pastor, I pray for you and for our church every day!” I encouraged her to continue to pray, as that was the most important thing that could be done for our congregation and me as her pastor. It may very well be that those who clean the church, prepare for the Lord’s Supper and bake for the monthly covered dish supper may be too busy to pray regularly. For this reason, it is helpful to have those who will faithfully pray for the church and pastor. 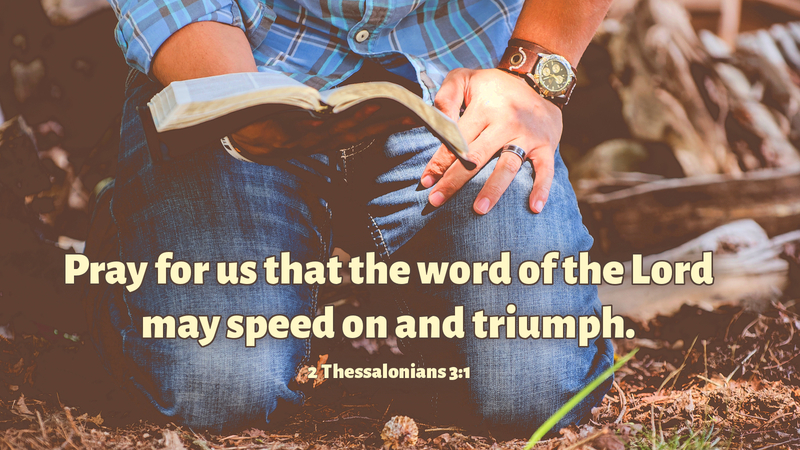 Paul didn’t hesitate to ask the Thessalonians to pray for him and his companions in mission. He solicited their prayers—not only for his own health and well-being, not only for deliverance from wicked and evil men (and women) but that the word of the Lord he was proclaiming might speed on its way, triumphing as it went forth! Prayer: Lord God, as you are always ready to hear, make us always ready to pray—for our loved ones, for our church and yes, for pastors! In Jesus’ name. Amen. Advent Action: Pray for your pastor and congregation daily!